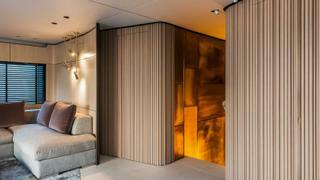 Endeavour II’s interiors mix East with West and vintage with contemporary, and work well as a unit. Endeavour II’s tenders and toys include a 7m custom limo tender, a 6m custom amphibious tender and two Seabobs. 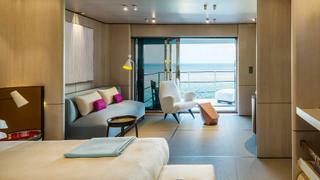 The owner's suite also includes sliding doors, to starboard, that lead to a private fold-out balcony. 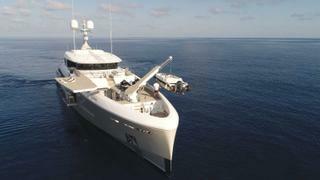 Exceptional cruising plans require exceptional yachts. This must have been what Endeavour II’s owners were thinking when they asked Rossinavi to build them something more than a typical superyacht to holiday on. Their brief was for a truly ocean-going boat that could be used year round but that would look modern and clean-lined instead of sturdy and workaday. 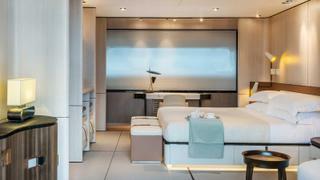 In other words, an expedition yacht in disguise. Experienced sailors looking to reward themselves for a lifetime of work, Endeavour II’s owners planned to spend months at a time on board, exploring lesser known oceans while retracing Magellan’s circumnavigation and Captain Cook’s expeditions. Elsewhere, touches indicate that she is far more than a milk runner, like the synthetic teak decks that can take far more punishment than genuine teak, and the compactors and refrigerator for storing organic waste for those long periods between ports. 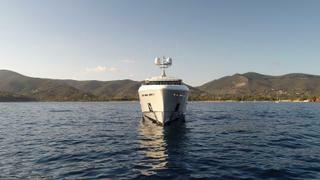 Endeavour II’s diesel-electric propulsion system, meanwhile, helps reduce fuel consumption. 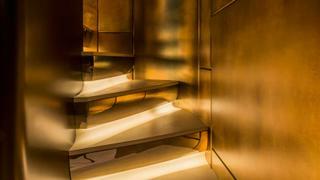 Salvagni’s interiors contrast with the “boy toy” aesthetic you might expect boarding an expedition yacht and it’s the surprise effect that makes Endeavour II so memorable. Entering the main saloon is like walking into the cool serenity of a winter sunset: pale blues and greys grounded by black, subtle pinks spiked by lacquer red, round soft shapes like snowdrifts accented by burnished gold. Everything is pleasing, even soothing, to the eye, and everything calls out to be touched. Starting from the floor covering springing softly under foot: could that be tatami, Japanese straw mats? 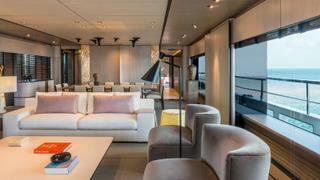 While the ottomans, sofas and armchairs in the saloon are custom pieces designed by Salvagni for the yacht, the 12 chairs around the dining table speak of a past history and an interesting one at that. “I don’t use production pieces in my interiors because I’m not filling up a furniture showroom: every interior I design is exclusive and unique, custom made to fit the owners’ taste. That’s why I only use my own designs or pieces by great architects from the past that I source from other collectors or at auctions. 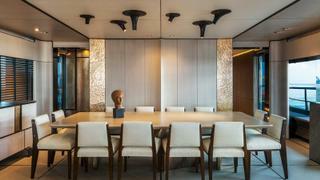 The art deco dining chairs are by the French designer Paul Dupré-Lafon and the mid-century floor lamps are by Stilnovo. 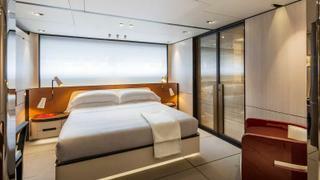 Endeavour II has two twin cabins and a full beam VIP suite that can become two double cabins by closing sliding shōji-style doors made from the same roughly woven cotton fabric sandwiched between glass that is used to create screen-like doors for the yacht’s en-suite bathrooms. While Endeavour II proves that an expedition yacht can be defined more by her function than by her aesthetics, she has everything that you would expect from a yacht built for long range, efficient cruising. She runs on two Caterpillar C32 Acert engines driving twin diesel-electric Rolls-Royce azimuthing pods, a power plant that gives her a range of 5,000 nautical miles at 12 knots. So what’s stopping her stretching those sea legs and seeing the world? 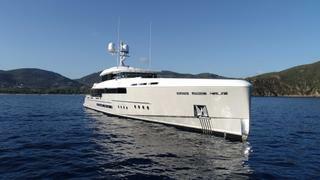 Her owner’s plans changed and she’s now up for sale, asking €29.5 million. A snip, surely, for any ocean-adventuring Japanophiles out there who want to round Cape Horn in style. This article was originally published in the May 2018 edition of Boat International.